As early as the 1920s Communist Soviet and then Chinese agents had been infiltrating Malaya and in 1929 the Malayan Communist Party (MCP) was formed with the intention of overthrowing the Malayan Administration and establishing a Communist-controlled democratic republic. When Japan invaded China, support for the MCP grew and, ironically, following the Japanese occupation of Malaya in 1941, it was the MCP which received backing from Britain as the principle force capable of mounting guerrilla operations against the invaders. After the end of the Second World War, the MCP revived its original aims through peaceful means but found little popular support amongst the Malayans. So the Communists turned to violence, with a program of murders and sabotage. By the summer of 1948 the scale of insurrection was such that Emergency Powers were invoked by the Federal Government on 16 June and the military authorities were called in to assist the civil administration in restoring law and order – and this included squadrons of the RAF, RAAF, RNZAF, and the local auxiliary and national air forces. The difficulties of operating in a country the size of England and Wales, of which 80 per cent is dense jungle, against a mobile force of less than 10,000 were immense. Yet over the course of the Emergency a highly-effective system of rapid response to guerrilla attacks and planned offensive strikes was developed. 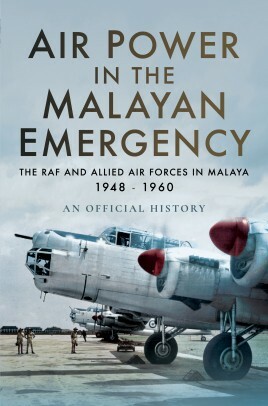 Though never amounting to more than six or seven squadrons, typically equipped with Spitfires, Beaufighters, Tempests, Lincolns and Sunderlands, and later with Vampires and Venoms, the RAF and Commonwealth crews helped the British and Malayan authorities defeat the insurgents.